There are 2 ferry routes operating between Lesbos and Samos offering you combined total of 4 sailings per week. Hellenic Seaways operates 2 routes, Mytilene to Vathi runs 3 times per week & Mytilene to Karlovassi about 1 time weekly. As the frequency and duration of crossings on some routes varies we would advise that you do a live search for crossings from Lesbos to Samos to get the most up to date information. Lesbos is the third largest Greek island located in the north-eastern Aegean Sea, boasting one of the sunniest climates in the country. Its landscape is both diverse and beautiful, compacted with unspoilt beaches, fossilised forests and archaeological monuments. However, the most attractive feature of Lesbos is the absence of mass tourism, unlike some other Greek islands, making it one of the country’s more peaceful holiday destinations. Given the tranquillity, a trip to Lesbos gives visitors a chance to gain a true Greek experience by enjoying the authentic cuisine and relaxing on the long stretches of untouched coastline. As the Aegean Sea is home to a large number of islands, there are plenty of ferry routes from Lesbos on offer. From the port town of Mytilini on the southeast coast, you can sail to numerous islands and the Greek mainland. Samos is one of the most famous islands in Greece, close to the Turkish coast in the Aegean Sea, separated by the mile-wide Mycale Strait. 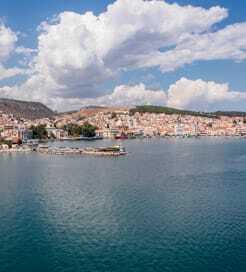 Steeped in history of legendary proportion, Samos is believed to be the birthplace of Greek Goddess, Hera. Consequently, the ruinous Heraion, once the largest temple in Greece, is one of the top attractions. Famous mathematician, Pythagoras was also born here. 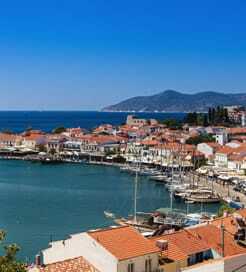 But, beyond the historical significance of Samos lies one of the most physically appealing islands in the Aegean, with an endless choice of typically beautiful, Mediterranean beaches with warm, clear waters. The capital and largest town, Vathy has plenty of lively bars and restaurants, but most visitors head to the stunning port village of Pythagorio for its traditional architecture and sublime seafront views. Greece is one of the easiest countries to travel by ferry, due to the high concentration of islands in the Aegean Sea. Samos has a few ports which are served by a range of excellent ferry operators, sailing from a huge number of domestic cities and archipelagos.